Seen this in a wine shop window the last day I was messengering in the city. I hear prince William is playing again so the crowds will be nuts. Free to the public, and there is the private party for the snotty sort. Take a bike and you get a jump to the front of the ferry line, just a tip. But I know not many bike polo players will hit this up because ESPI5 is going on at the same time. Otherwise watching horse polo is really fun. It puts our version into a new perspective. Check it out if you have the chance. 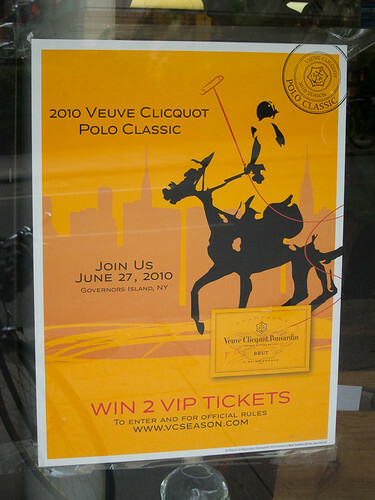 This entry was posted by Doug D on June 23, 2010 at 5:40 pm, and is filled under New York, Past Races and Other Events. Follow any responses to this post through RSS 2.0. You can leave a response or trackback from your own site. Hope that prince H gonna kill his favourite horse again!